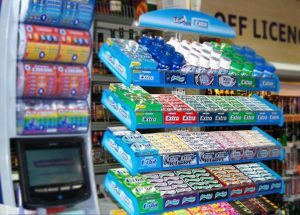 Why Chewing Gum Is Bad For Your Health? We’ve all been there. You just finished your delicious dinner or your cup of coffee while out with friends and all of a sudden you realize you have bad breath. Heaven forbid you have to be anywhere close to someone to talk to them for fear that they’ll smell what you just ate or drank and always remember that experience! So, what do you do? You reach in your purse or nudge a friend for a piece of chewing gum. Now you can breathe a breath of fresh air (literally) knowing you won’t knock your friend over when you continue your conversation. But can you really trust that the piece of gum you’ve just popped in your mouth is truly benefiting you or is it simply masking one problem while creating others? Chewing gum may seem harmless, but you would be surprised at the damage this little stick can do to your body! Artificial sweeteners have been controversial for quite a while. On the one hand, they seem to provide a low or no calorie option for sweetness; on the other hand, artificial sweeteners have been shown to be appetite stimulants, increased calorie (via junk food) intake, and, ironically, promote weight gain. 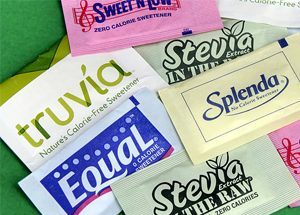 Certain artificial sweeteners seem to be worse than others. Aspartame, perhaps the most controversial one, contains phenylalanine which can be deadly to those with a certain serious health condition called phenylketonuria. It has also been linked to brain tumors, cancers and birth defects. Sucralose (commonly known as Splenda) is one that many who are aware of the dangers of aspartame will opt to consume, but it has its own dangers. The FDA approved the use of sucralose after only two human studies were conducted. What’s even crazier is that the longest of those two studies lasted a whopping four days! 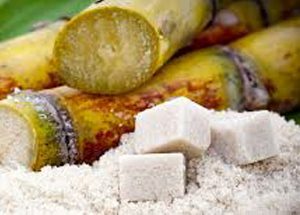 Maltitol is another popular sugar alcohol in sugar-free gum. It has been associated with gastrointestinal issues when consumed in large amounts. Mannitol is a sweetener that also is a medication. Other than sweetening gum, it also provides a pleasant and cooling mouthfeel. It is poorly absorbed by the intestines when consumed and comes with an array of side effects when injected for medical purposes. Acesulfame Potassium was approved for use in 1988, but the animal studies that were used for approval actually found a correlation between this sweetener and cancer. Even an FDA staff member questioned whether the studies were definitive enough to allow this product for use in food. Artificial colors and flavors have been connected to an extensive number of health issues, especially in children. 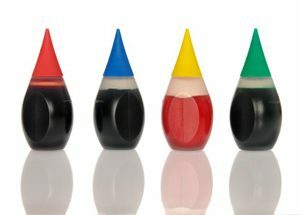 Red, Blue and Yellow dyes are known to cause hyperactivity in children. Artificial flavors are those that are created in a laboratory in order to mask the real taste of a food or drink. For example, if you think you are eating peppermint, you aren’t actually consuming any real peppermint or peppermint oil. What you’re tasting is a flavor that was lab-made and isn’t something the body was intended to process! Any gums that do not explicitly state “Non-GMO” most likely have ingredients made from GMO products. Genetically modified organisms can be damaging to the body and cause an array of health issues. Many non-sugar-free gums contain sugar that most likely comes from GMO sugar beets or corn. Gum base—this is what it sounds like…the part of the gum that gives it its “chew”. It is made from food-grade polymers, elastomers, fillers and resins. While most manufacturers do not reveal what their specific compositions entail, know that you could possibly be chewing on talc (yes, the same talc that has been linked to cancer), paraffin wax and polyvinyl acetate (carpenter’s glue). Butylated hydroxytoluene (BHT)—this ingredient is one that you should avoid consuming at all costs. It is typically used in a variety of cosmetic ingredients as well as a food additive in the United States, but it is banned from use in other countries! It has been linked to kidney and liver damage, cancer and hyperactivity in children. Titanium dioxide—used to create a white color, oral use of titanium dioxide has been associated with autoimmune disorders, Crohn’s disease and asthma. Calcium phosphate (calcium casein peptone)—this ingredient is mostly found in Trident gum as a whitener and texturizer. It is derived from milk but it extremely processed. There is very little known about this ingredient and its potential dangers, but casein is a known autoimmunity trigger and was connected to poisonings in infant formula in China. If you think about it, chewing gum is like exercising your mouth, so it makes sense that if you chew gum frequently, it can cause tension in your muscles and even muscle imbalance if you tend to chew on one side more than the other. It can also cause or worsen temporomandibular joint disorder (TMJ). Headaches can occur in conjunction with jaw problems. It has also been established that teenagers who chew gum suffer from frequent headaches. A recent study showed a significant decrease in headaches of those who chewed gum between the ages of 6 and 19. Some people use gum to try to curb their cravings, but the reality is that it can actually make them worse. When you chew gum, you are signaling to your brain that food is on its way to your stomach even though nothing is being swallowed. Your digestive juices begin preparing to receive food, but since no food is entering the stomach, you are left feeling hungry. Research has also shown a correlation between chewing gum and diet. Researchers found that those who did not chew gum had a more nutritious diet than those who did. Non-gum-chewers were more inclined to choose fruits and vegetables than those who chewed gum. This may be due to the fact that minty gum and fruit and vegetable flavors do not mix. Gastrointestinal issues are a known side-effect of the sugar alcohols in sugar-free gums, but GI problems may also be caused by the amount of excess air that is swallowed when chewing gum. Bloating, diarrhea and other types of GI distress can occur. Sugar-free gums are touted to help prevent tooth decay in some cases, but the reality is that the acidic flavors and preservatives can lead to dental decay (not necessarily cavities). Dental erosion/decay is the decalcification of your teeth—they dissolve. Sugary gums allow sugar to be in contact with your teeth for an extended period of time which can clearly cause all sorts of dental issues. The mercury enters your bloodstream and wreaks havoc on your body! While it is true that you do not typically swallow your gum, these ingredients and chemicals that we have discussed can still be absorbed into the body during the chewing process making gum something you want to avoid altogether. This is looking pretty bleak for gum lovers. What can you do instead? There are a few natural options out there that go beyond masking bad breath—they can cure it! If you have them around, chewing fresh mint leaves always provides that nice, fresh feeling. Fennel seeds are a great option for post-dinner or coffee breath freshening. They quickly freshen up your mouth and can be swallowed instead of being spit out because they are a natural food. Always be aware of what you are putting into your body by reading the ingredient labels! As you have seen, even something as seemingly innocent as chewing gum can have devastating effects on your health! Especially your digestive health! Emma Deangela is the best selling author of The Alkaline Diet Program and 80/20 Fat Loss. She has helped over tens of thousands of men and women to lose weight and transform their health with sound nutrition advice. Learn how you can lose weight fast – How to lose weight by adding these alkaline foods. Do you still chew gums? 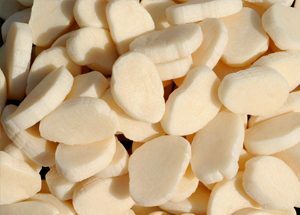 Please share with your friends this article on Chewing Gum – Use any of the social media and email buttons on the left of our website. Wrigley’s Doublemint has a gum made in France with NO artificial sweeteners, while not perfect, it has less chemical ingredients than the gums you mentioned. Sugar, gum base, soy lecithin, glycerol, and BHA (to maintain freshness). Seems to be difficult to get here. Wal Mart and CVS drug store carry it, but always seem to be out of it. Good article. My 4th grader’s teacher just sent notice home she would like to have the kids chew gum during math to help them focus. I get the concept as this same child had to use a rubber band to tweet while doing work in her old school. What do you suggest instead of gum? Hello Barry, please check 1931 Nobel Peace Price winner Otto Warburg and you will find the treatment for your cancer and all other diseases which all require acidic conditions to manifest! What about xylitol that is touted for help in gettin rid of cavaties?